We offer Roseville urgent care! We provide an affordable alternative to health care that’s too urgent to wait for the family physician and much less expensive than the ER for non life-threatening. Med Care Medical Center is a high quality and affordable urgent care center that provides experienced physicians who are dedicated to treating patients with skill, care and respect. To be even more convenient, no appointment is needed for your visit, we have extended hours 7 days a week, and you get full transparency for all of our services. Going to the emergency room (ER) can cost a lot of time and money while 84% of people who visit the ER don’t have a medical emergency and can may pay up to six times more than urgent care facilities. Primary care physicians often have wait times in the days or weeks time frame and could result in your condition becoming worse or requiring more complex and more expensive treatments. In many cases, our Roseville urgent care physicians offers options that can save both time and money. When you or your child is sick, injured, or in pain, having to wait to see a physician can be agony. Often your primary care physician is too busy to see you right away and the ER is too expensive, crowded, and you might lose hours in the waiting room. You need our Roseville Urgent Care Center! We offer fast, comprehensive, professional and affordable health care to get you feeling better as soon as possible. Whether you are needing a flu shot, suffering from seasonal allergies, have a cut that needs stitches or a sprained ankle, we can help you feel better fast. 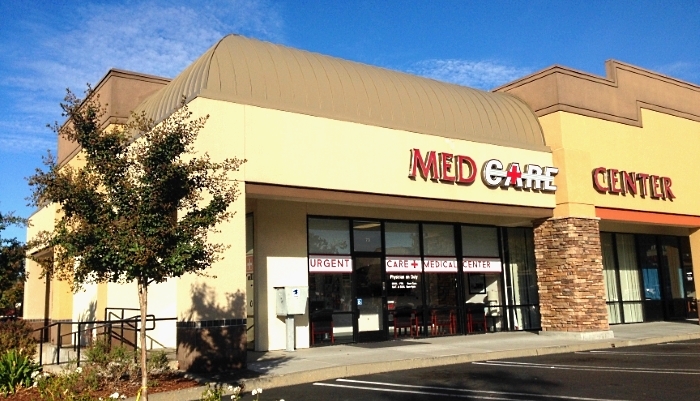 The next time you need to see a doctor for urgent care medical services and do not have time to to wait, simply walk right in to Med Care Medical Center in Roseville. Studies shows ER costs are 686% higher for the same quality of medical care received at an urgent care facility. Insurance companies usually have an urgent care or primary care co-payment that is much lower than the ER co-payment.